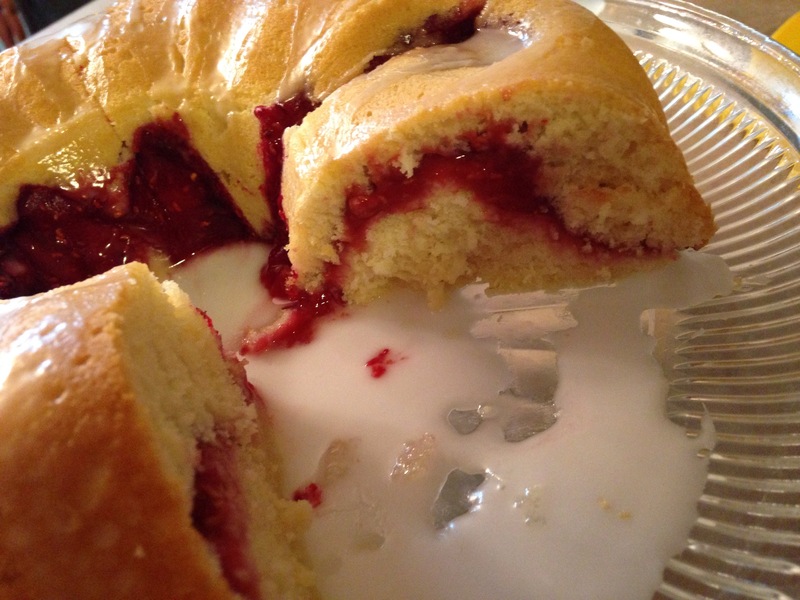 So, I made this cake as a bundt cake, but judging by the texture when it was done, I’d say it’s really more of a “pound” cake. It’s rather dense, but flavorful. I hope you enjoy it. My kids really liked it. This is a variation on a recipe i found in cooking light. 1. Combine raspberries, 1/4 cup granulated sugar, and 1 tablespoon water in a small saucepan. Bring to a boil. Reduce heat, and simmer 5 minutes or until berries break down and mixture thickens slightly, stirring frequently. Place cornstarch in a small bowl; add remaining 1 tablespoon water, stirring until smooth. Add cornstarch mixture to pan; cook 1 minute or until thick. Cool completely. Once the raspberry mixture is cool, use an immersion blender to pulverize the seeds as much as possible. You can also do this by pouring the mixture into a food processor. Place butter, Splenda Baking mix (or 1/2 c splenda/1/2 cup sugar) into a bowl or mixer and beat until smooth and creamy. Add eggs to sugar mixture, 1 at a time, mixing until all eggs are incorporated. Alternate between flour mixture and buttermilk, adding each one a little at a time to sugar mixture. Mix batter until everything is well incorporated. 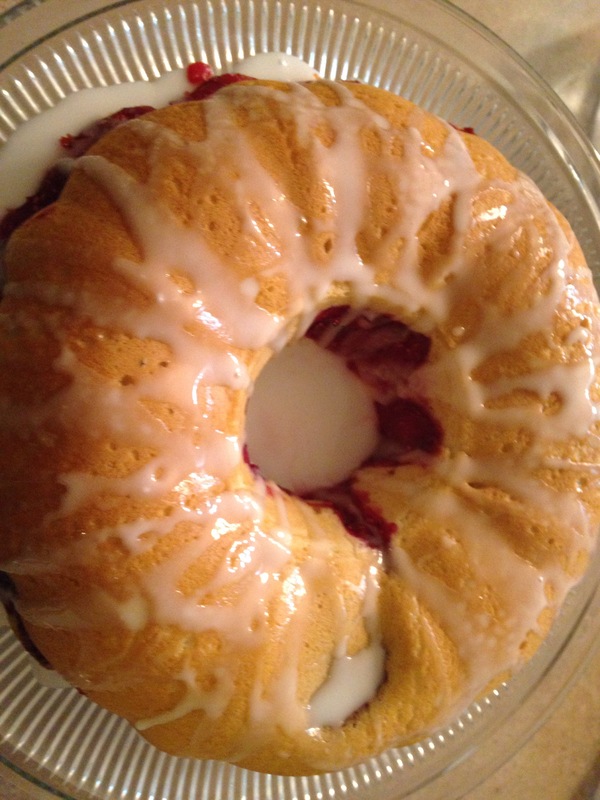 Spray your bundt cake with nonstick spray. Spread 1/2 of your cake mixture into the pan and spread it evenly. Pour 1/2 of your raspberry mixture over the top of your cake batter and spread evenly, reserving the other half of the raspberry mixture to top your cake. Pour remaining cake batter over the raspberry layer and smooth the batter so it’s evenly distributed. Bake on 350 for 25-28 minutes, or until a toothpick comes out clean. Remove cake from oven, and cool about 10 minutes. Then remove the cake and turn it out onto a cooling rack. Cool the cake completely. Combine powdered sugar and 2 tablespoons of water, and whisk it well until all lumps are gone. add additional water up to 3 tbsp total until glaze reaches desired consistency. 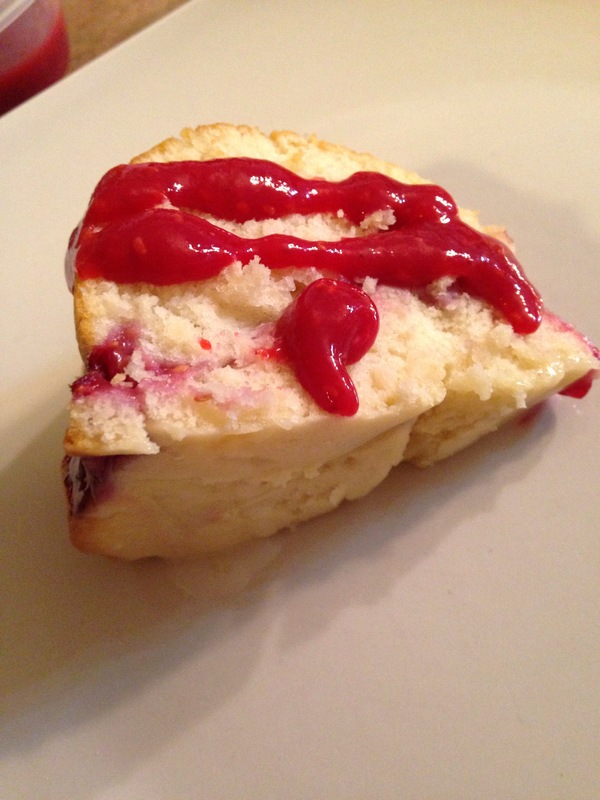 Slice cake and serve with a dollop of reserved raspberry sauce on top. This was a yummy side dish that I quite enjoyed. The sauce is lovely and quite different. It can be used over baked or broiled chicken or pork chops as well. Mix half of the tomato juice and all the corn starch in a small bowl and whisk until mixture is smooth. In a small skillet, mix tomato juice/cornstarch mixture, remaining 1/2 cup of tomato juice, chicken broth, salt, pepper and garlic powder to the pan. Bring the tomato gravy mixture to a boil. Reduce Heat and simmer, stirring constantly for 3 minutes, until thick. Remove tomato gravy from heat and stir in 1 TBSP of light butter. In a separate skillet, melt remaining 1 TBSP of butter. Add sliced zucchini to the melted butter, stir and cook for about 5 minutes until zucchini is soft. Add a little salt and pepper to the zucchini as it’s cooking. 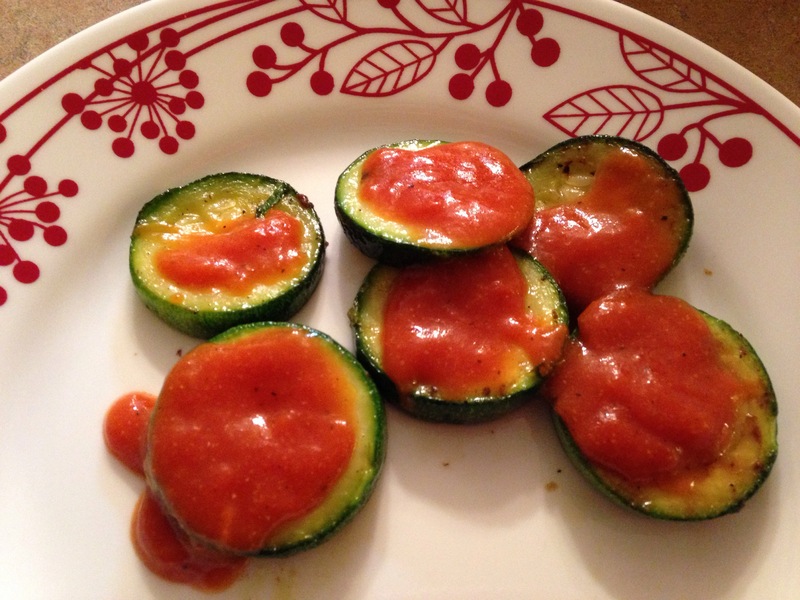 Once Zucchini is cooked, divide into 4 equal servings of zucchini, topped with tomato gravy. This is a dish that can very easily be made vegetarian, by using veggie broth and omitting Chicken, so I’m listing it as “vegetarian friendly” and including the calorie count for both versions. This is a “weekend” recipe, meaning, it takes some time and love to put together. 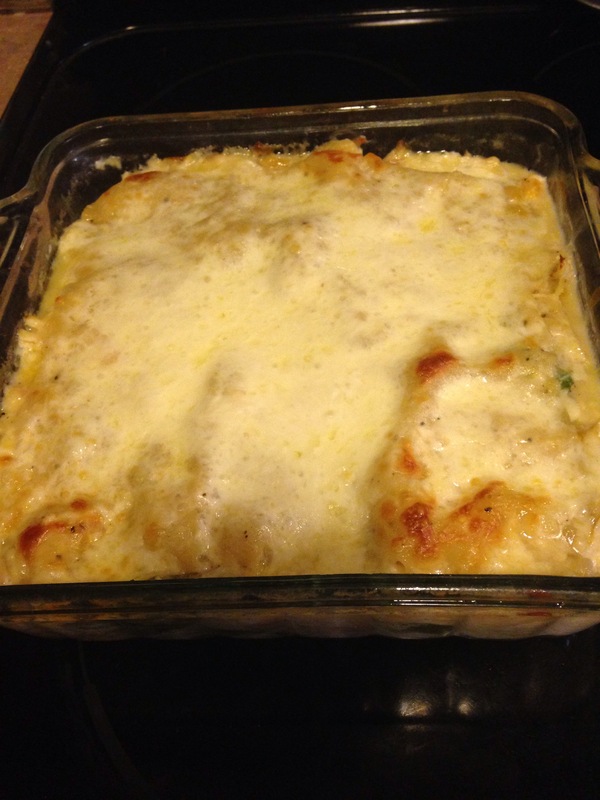 It’s not a “quick and easy” but it is yummy, and I hope you enjoy. NOTE: I made mine ahead, put it all together and let it sit in the fridge assembled for about 1 1/2 hrs before baking. This is an easy “make ahead” meal. It’s also a good “make an extra one to freeze for later” meal. Just use an aluminum pan, and wrap the extra one tightly in saran wrap, then foil. Freeze, and when ready to cook set it out to thaw- then remove all the foil and plastic, cover back with foil, and bake as directed. Wash, dry, and cut all veggies as described above, and set each aside for now. In a medium sized bowl, mix together: Ricotta, half of your paremsan cheese, egg whites, italian seasoning, salt and pepper. 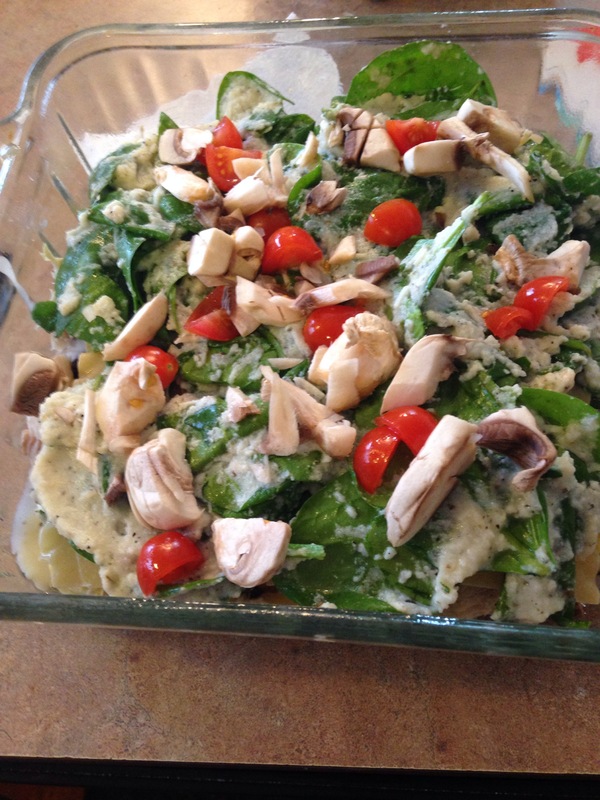 Stir your spinach leaves into the ricotta, mix thoroughly, and set the mixture aside for now. Next, you’re going to make your sauce. I used a 1 qt sauce pan and a wire whisk. First thing, melt the butter in the suace pan. Add onions and peppers, and stir constantly for about 3 minutes until onions are clear. Mix in your garlic and continue cooking and stirring about 30 seconds longer. Add flour into mixture, and stir until flour is well incorporated. Pour milk into mixture and stir until flour mixture is incorporated into milk and there are no lumps. Add chicken broth and continue to stir and cook until mixture begins to thicken (about 3-5 min). While your sauce is cooking, fill a 9×13 pan about 1/2 way with hot water and place your lasagna noodles into the pan to sit for 5-8 min (no longer than that). Once your sauce is thickened a bit, remove from heat and stir in nutmeg a remaining parmesan cheese. Using a 9×9 pan, sprayed with nonstick spray, Spoon about 1/4 cup of the sauce into the bottom of the pan and swirl it around until it covers the bottom. Trim all of your lasagna noodles to fit inside the pan. You’ll have to cut about 3 inches off the end of each one. I used kitchen scissors. Set noodles aside on a paper towel to dry. Layer the following items on top of the sauce: 3 noodles, side by side, slightly overlapping one another: Spread 1/2 of spinach mixture on top of noodles evenly. Sprinkle 1/2 of your mushrooms and onions over that. Next, spread 1/2 of chicken evenly over mixture. Top with about 1/2 cup of sauce poured evenly over top. Repeat that layer one more time, reserving about 1/4 cup of sauce for the top of the lasagna. 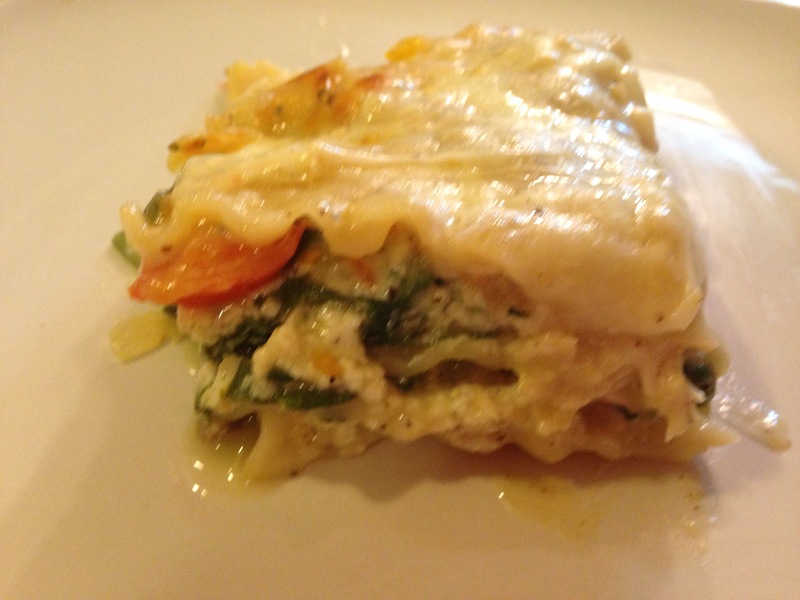 Layer your last 3 noodles over your top layer, creating the top of the lasagna. Spread remaining sauce over top, and then add mozzarella evenly over the top of the sauce. Bake, covered in foil for 40 min on 375 degrees. Remove foil and bake another 12 minutes.